For as long as anyone can remember, the Tokyo Stock Exchange has been the only game in town, with the OTC playing second fiddle. Now, with Nasdaq fast-approaching and deregulation a reality, Japan's local exchanges are opening up to hot technology startups. What's George Hara thinking? One of Japan's most controversial VCs, he lives in the States and has had no interest in Japanese companies -- until now. We ask why he's changed his tune. Hackers in Japan have cracked into NTT, the Ministry of Posts and Telecommunications' astronomy lab, and a variety of networks in just the past few months. Just like in America, there are legions of b-students keen to build their own dot.com fortunes. But how do you tackle an intensely individualistic topic like entrepreneurship in a culture where the nail that sticks up gets hammered down? 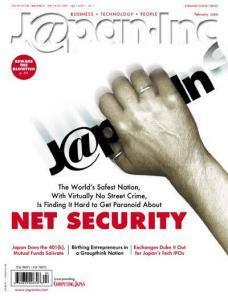 Recommendations for improving Japan's venture capital system. Bureaucrats, lawmakers, functionaries, finders, angels, investors, and entrepreneurs: Pay attention! In Part 2 of our mutual funds coverage, opportunity is the keyword -- opportunity for individual and institutional investors. If just one-fifth of the savings held by the Japanese is transferred to a proposed 401(k)-style plan, it will create a market worth JPY 48 trillion. But is the Japanese wage earner ready to take responsibility? The recent lawsuit filed against Japan's Toshiba has already prompted a number of copycat suits, boding ill for the entire chip and computer industry. Ever imagine what would happen if the PIN you use to access your voicemail system were stolen? One NTT DoCoMo subscriber doesn't have to imagine. You've heard about first-mover advantage, but is there a first-lister advantage? Two of the first players to list on the Tokyo Stock Exchange's new Mothers market are hoping so. There's no doubt that Internet Research Institute and Liquid Audio Japan are getting unusual exposure because of their first-lister status, but are they buzz worthy? Let's take a closer look. Exodus, which describes itself as North America's top provider of Internet systems and network management solutions for enterprises with mission-critical Internet operations, acquired GOL to expand its operations outside the US and Europe. Softbank moved to further expand its financial activities by bidding -- in conjunction with a group of partners - for the temporarily nationalized Nippon Credit Bank on November 12. Online trading is hot. Maybe too hot. Many of Japan's securities firms underestimated its popularity and were caught unprepared for the onslaught of new subscribers. As if Japanese banks don't have enough problems with restructuring, mergers, and realignment in many financial subsectors, they now face a head-on challenge from convenience stores. Whatever became of the Japanese trading company? In Japan, the average number of children born to each woman of child-bearing age has been steadily falling over the past three decades, and reached a record low of 1.38 in 1998. Since a birthrate of 2.08 children is considered to be the minimum required simply to maintain a level population, demographers here have been vying to calculate the exact year, date, and time when the sun will set on the last surviving Japanese inhabitant of the land of the rising sun. The music world's avante-garde don't come much more avante than Sachiko M, a musician who uses samplers almost exclusively.